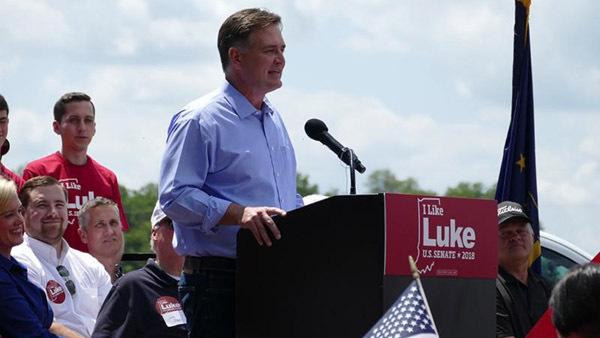 Luke Messer has always been a good politician. Until Donald Trump, and then Roy Moore, came along that is. As Rep. Messer has risen in leadership in the House Republican Caucus, he has found himself on the fifteen person leadership team of the Republican National Committee. Roy Moore, the embattled candidate for the U.S. Senate in Alabama, has taken the RNC for a ride this Fall which has exposed a quandary for the Grand Old Party. In mid-November, after the now famous Washington Post story came out detailing stories of sexually abusive and assaultive behavior from Moore, leadership in the Senate and the RNC pulled their support from his campaign. With only a few weeks left in what has now become a watershed election for the nation, Politico reported what appeared to be a permanent RNC withdrawal from the race. That was November 14. Donald Trump never took the bait though. The whole saga started when he was on his trip to Asia, and he delayed meaningful comment for several days upon his return. Then on November 21, he showed his hand. In an impromptu White House lawn press conference on his way out of town, Trump seemed to defend Moore’s innocence based solely on Moore’s denials. Since then, his support for Moore’s candidacy has grown into full fledged campaigning for him, featuring a Friday night rally just south of the Alabama border in Pensacola, Florida. That support led the RNC to reverse course earlier this week. It withdrew its earlier withdrawal of November 14, and re-engaged on Moore’s behalf. These decisions don’t happen without some level of discussion internally, which is the point of today’s column. The question to Messer is very simple: what role did you play, as a member of the RNC leadership team, on the decisions to withdraw from, and then reenter, the Roy Moore campaign? I have also asked local media outlets to look into it, though none appear to have done so. The question itself is being ignored. I sent messages to the Messer campaign multiple times via Twitter and Facebook this week. No response has been received. For those of you who don’t know Luke, he actually did have a brand that predates Trump and Moore. He was a well liked executive director of the Indiana Republican Party. He then had success in the Statehouse as a two term member of the Indiana House, championing school choice legislation and addressing the state’s dropout rates. Replacing Vice President Mike Pence in Indiana’s Sixth Congressional District in 2012 seemed easy and logical. Just this week, Messer filed a bill to modernize the shameful sexual harassment complaint process that exists in Congress. Good move. However, there are no real partisan risks involved with that, and I imagine every innocent member wants to file that bill. The issue is whether our political structures should support a candidate for Congress, knowing up front, the candidate has sexually deviant, and otherwise intolerable behavior in his or her past. Most of my Republican friends indignantly say “hell no” to me when I ask that question. When Trump won Indiana with 59% of the vote in 2016, Republicans in Indiana fell in line with him. The congressional delegation has been a blank check for the new president so far, not just in voting, but in public comment as well. Seven of Indiana’s nine House seats are filled by Republicans, and I am pretty sure their collective voting record is 100% with the president. The top two U.S. Senate candidates in Indiana from the GOP are Messer and U.S. Rep. Todd Rokita. Aside from the mudslinging at each other on petty items, their campaigns thus far are merely a contest to see who is the most Trumpish. I worry that they might become more Trumpish than Trump, if given the chance. The latest Trumpism is to support an accused child molester because he and the Republicans erroneously believe they need the Senate seat more than they need to preserve their own morality. The RNC balked at Moore when Trump was away on business. When he came home, they fell back in line. Messer should disclose his role, and his position on this matter. Shame on Alabama if they elect Roy Moore. I believe the nation will respond negatively to the GOP brand next November if they do. If Alabama does the unthinkable, shame on Indiana if we let Luke Messer be complicit in it for free.